It doesn’t seem like four years since Koloss was out, but it has been, and my initial listens to The Violent Sleep of Reason were accordingly a little dismissive. From the similarly pretentious title to the similar-styled cover art, there’s definitely a sense of deja vu to Meshuggah’s latest outing, and if this review can do anything positive, then it can implore that you stick with it, as given time this emerges as amongst the band’s best ever material. Meshuggah are a band that twist their technical groove into varying combinations of catchiness, heaviness and hypnotic mechanical atmosphere, and although they haven’t really changed their formula in a good few years (writing an entire album around a single riff doesn’t count, does it?) they always manage to create something that feels fresh. Quite an achievement given how monotone the band can be, from Jens Kidman’s vocals to the downtuned guitars – often, listening to a Meshuggah album is all about focusing on the drums and hanging on for dear life, and thanks to Tomas Haake’s s(t)ick skills that’s never a bad experience. None of their djent offspring ever sound quite the same, are ever quite so expert at crafting the inhuman atmosphere, are so close to breaking free of metal’s gravitational pull to shoot off into some sort of free-jazz/noise galaxy. Meshuggah are truly unique, which makes reviewing them as difficult as ever; this is an experience unlike any other in music today, how can it be anything other than vital? Well, having alien robots shouting at you for an hour isn’t exactly everyone’s idea of a good time. And it remains the case that as much as obSessives can take pleasure in examining the exact differences between different shades of obsidian, the fact remains that for the uninitiated/uninterested, Meshuggah still sounds very much like themselves. Differences from Koloss to this album, then, are subtle, and of interest only to people who will bother listening to it anyway, because it’s Meshuggah, one of metal’s most creative and original bands, and reviews are superfluous. (Apparently it was recorded live in the studio, but it’ll take better ears than mine to pick up on any spontaneous sloppiness, because Meshuggah are nothing if not superb musicians.) Yet there is something of a sense of purpose about The Violent Sleep of Reason, from the lyrics which seem a little more grounded in reality than usual, attacking totalitarianism and having a clearly directed anger in the likes of Our Rage Won’t Die, to the grooving polymorphic riffs themselves, which are consistently insistent, booming out relentlessly in front of and behind the clattering, octopus-like drums. Opener Clockworks is a stuttering rhymthic barrage, riffs scraping alongside and over each other, simultaneously simple and complex – and that’s before the wheedling tonal shifts of the lead guitar “solo”, as distinct to Meshuggah as Slayer’s are to them. Even having been a fan for years, this is impressive stuff, devastatingly effective whether you’re focused on the atmospheric darkness of the whole, the individual mind-bending grooves, or even the simple heaviness of it all. Born in Dissonance sounds like a psychotic computer trying to cover Suffocation, for instance, the weighty, powerful riffs churning away unrelentingly as the machine re-imagines death metal for an inhuman audience. You can almost see the robots flinging themselves into each other in the mosh pit to the accompaniment of MonstroCity, danceable only in a very discordant system, but oddly catchy despite that. The slower pace of By the Ton and Into Decay increases the heaviness, as close to doom as Meshuggah will probably ever get, while the title track and Ivory Tower up the claustrophobia by impacting the listener with sound. An oddly beautiful melodic outro to Stifled helps to break the tension, but there’s little variety otherwise except in songwriting – which may not be as catchy as in the past, but in terms of painting from the band’s limited palette, is remarkably good. 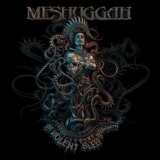 Meshuggah are a solid band that hit their peak early in their career and have shown little sign of reducing that quality; The Violent Sleep of Reason is yet another outstanding album from them.